Dr. Towunmi Coker is a writer and the founder of Towunmi Coker Literary Initiative, TCLI. 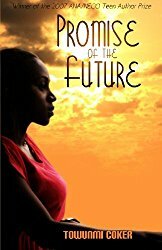 In this @naijabooks interview, she talks about her book, ‘Promise of the Future’. I have been writing since I could use a pencil on a paper. I began in elementary school mostly after reading a book I did not like the ending; so I wrote my own story on a jotter. Tell us about your book 'Promise of the Future'. My book 'Promise of the Future' is about a young girl, Ajoke, who was rechristened Celestina, by a woman she worked for. She was from a wealthy family but a sudden misfortune on her family led her to live with foster parents, where the madam of the house treated her as a maid. She encounters some other obstacles in her journey through life and the unfolding of twists lead us to some real life situations, and we wonder if the promise of the future holds beauty or more pain. What is the motivation behind it? The motivation steamed from two story ideas I had for a long period of time. One was from my experience growing, where people always say people always get a negative reward for every bad act. I realised this is not true in reality and I always wanted to pen something on that especially for negative acts people engage in unintentionally. The saying ignorance is not an excuse, though true does not necessarily mean ignorance leads to punishment. Another motivation was an experience during my first year of clinical school as a medical doctor. A combination of these brought about 'Promise of the Future'. Tell us about Towunmi Coker Literary Initiative. Towunmi Coker Literary Initiative is a nonprofit organisation that effects needed societal changes through literature, arts and culture. We organise a yearly creative writing competition among secondary school students in Lagos State to promote reading and writing culture. We also effect other needed societal changes such as a play we staged five times to commemorate 2014 world HIV day. We have also collaborated with other organisations to promote health awareness such as an awareness on hepatitis which we did last year with #20dayson Hepatitis. Another of our collaboration is with Yetunde Sarumi Collection, where mentoring for students occur. We also have a project to build a community library in Lagos which can be viewed here; donations can also be made to support us. Apart from also being a medical doctor, you are an agropreneur. What do you do as an agropreneur? As an agropreneur, I am basically an entrepreneur interested in agriculture. I am interested in making changes and watching things grow. I believe agriculture is an important part of our lives and also contributes immensely to any nation. So apart from being a medical doctor, I am a farmer interested in contributing to individual and nations livelihood and GDP through one of nature's best gift to mankind. My book can be purchased through Rovingsheights on Konga, Jumai and at Cafe Neo outlets in Lagos.